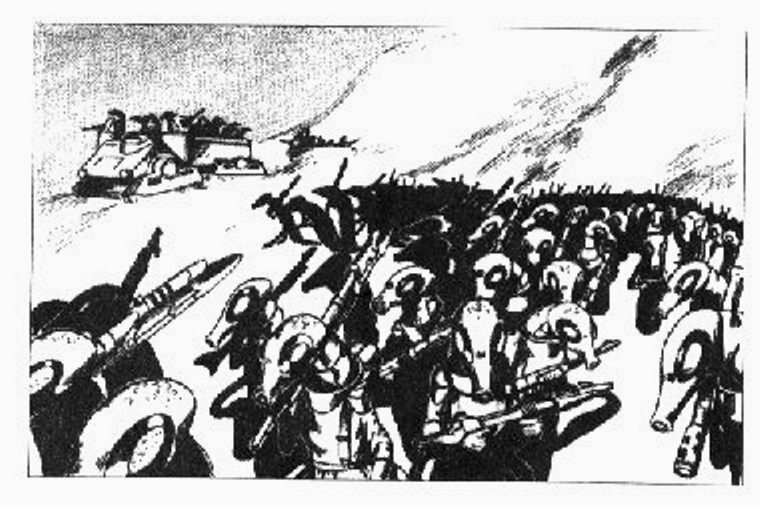 Update: Since I've submitted a story about Sathar vehicles to Frontier Explorer, I'll rededicate part of this discussion to looking at how Sathar troops are presented in the various TSR modules and any fan-created adventures that I've seen. The picture below is from Starspawn of Volturnus... definitely a canon adventure. This appears to be a treadmobile with an articulated front end. It has one heavy weapon mount on the front, right side, and a second heavy weapon mount just behind the driver. It can probably transport about a dozen Sathar soldiers who have the ability to fire their own weapons out the sides. This vehicle is most likely a full tread version of the half-track transport. They are probably only lightly armored and certainly not something to use in a vacuum or poisonous atmosphere... at least, not without the troops wearing vacc suits. I would go with this being effectively the same vehicle. its simply a fully tracked version of the one we've been discussing elsewhere. good catch. those sathar look like they are wearing a defensive suit. Submitted a Sathar vehicle story to Frontier Explorer! Next in line is the story on Sathar robots. The Sathar boarding party from the "Assault on Starship Omicron" mini-module. There are 10 Sathar that are part of the boarding party and they are supported by 8 Zuraqqor, two quickdeaths and one cybodragon. Their defenses include a military skeinsuit and an albedo screen. Each worm has a 50 SEU beltpack, probaby to power the defense screen, but it also has a laser rife with 20 SEU clip and 1 fragmentation grenade... I've wondered about why they would be armed with fragmentation grenades for a ship boarding operation. What about explosions in confined spaces such as in an airlock or small corridor? No worries about punching a hole in the hull or a window? All the Sathar have Beam Weapons 2... not too skilled there. Their base chance to-hit is 40% with the laser rifle and 20% with grenades. Now, Sathar "A" has a computer skill, level 5. Sathar "C" and "D" also carried a smoke grenade. Sathar "F" had a medical skill of 5 and a medkit! So they do have medics. The Zurraqqor are not the strongest or brightest of races. They wear military skeinsuits and heft around automatic rifles with 1 clip and one reloads. I guess no worries about punching holes to the outside? The cybodragon and quickdeaths are standard for their species. One further note about the Zuraqqor is that they developed the Rogue Robot for another scenario where the Omicron's robots turn against the PCs. So, are the Sathar presented as the boarding party typical? They are better armored than, as we will see, the troops deployed to Volturnus, but are a bit weak on combat skills. No hints are provided for role playing interaction with the Sathar. This is strictly a combat, takeover mission for the worms, unless the referee gets creative. The only Sathar present is the "tubed brain" that is controlling the monitoring station, which is a 20-meter tall metallic pyramid. The tubed brain controls the Sathar artifact on Volturnus. The monitoring station incluydes a radio telescope, transmitter, and anti-aircraft laser set at 20 SEU and a 60% chance to hit. The interior defenses remind one of a D&D dungeon crawl with traps and monsters. There is one Sathar Attack Robot, which has 200 STA, two laser pistols and two grenades. Must be a rather old robot. Are these creatures routinely fed? Who or what removes any waste? Must be the Slavebots doing the work... Could the quickdeaths be kept in a stasis field and are released when some hapless soul enters the artifact? Has this event occurred sometime in the past? Then we have ths slavebots -- the Eorna who had their brains removed and replaced by cybernetic controls. The slavebots are the hands and feet of the tubed brain. there are some 9 active Eorna slavebots. There are cots in the slavebot quarters, so these creatures need rest? Food is also present, so obviously the slavebots need something to keep their biological systems working. The Freezer Chamber, to me, should be especially creepy... if not larger. How many bodies? How long does a slavebot's body last? Are the cybernetics from one slavebot transferred to the new body? What about wear and tear on the systems? Are new parts manufactured somewhere on site? Besided the nine active slavebots, maybe there is a conveyor system down here and spare parts. As slavebots get blown away up top, the machinery in this room activates and starts prepping replacement slavebots unless the characters have damaged or destroyed the machinery here. The Sathar Brain is described as sitting in a huge flask in the center of a room. Tubes connect this flask to others about the room along with wires. No personality is given for the brain, but doesn't this scene beg for some more development? I would argue that it's a place for some roleplaying! (Unless the players do the wise thing and blow up the tubed brain right away). The Sathar army consists of at least 30,000 troops plus robots and other weapons. There are 18 Sathar soldiers, I guess two are the cannon's crew. "the crewmen are also armed with laser rifles with one full clip"
Possible problem with the remastered module: One page says the Sathar forces should include "1 robot brain counter and 2 Sathar counters"
Observations, the Sathar are heavily dependent on their robots in this encounter if there are only two of the worms present. These Sathar are rather under armed and under armored. But, they probably expected to be behind the lines. Starspawn Battle Two vs. the Edestekai. Sathar receive 5 new Sathar troops whenever 5 are killed. They have 1 laser rifle with 1 full clip... under armed yet again... though they have a chance to win by not losing all their troops in one turn. Now these Sathar have Beam Weapons 2 and the ubiquos laser rifles with 1 clip... at least they know how to use them! The other Sathar apparently had a level of 0 when using their laser rifles. The Sathar also have their special electric field defense that will cause 10d10 points of damage to anything that crosses the line... not too bad of a defense. 3. 5 average Sather. 2 have laser rifles, 1 with gyrojet rifle, 2 with sonic disruptors and laser pistols. 4. 5 average Sathar with laser rifles plus one standard combat robot with laser rifle. 6. 10 Sathar with laser rifles plus 1 cybodragon. The Sathar army of "Starspawn" appears to be composed of conscripts. They are very under armed, lacking melee weapons or grenades and lack any basic personal protection. Most of these Sathar seem to lack any skills to use the weapons they are equipped with! I think its assumed that they can use them. Some of the pirate stats in Crash on Volturnus lack a mention of skills. but if the pirate shows up with shock gloves its assumed he can used them. True, but the referee looking at this module is going to say: "Well, so-and-so's Randed Weapon (RW) stat says this and the Melee stat (M) says that... in the case of the most of the Sathar soldiers it is RW 20, M 20. So, they are going to have that score to-hit. The Sathar here seem to be there to die. 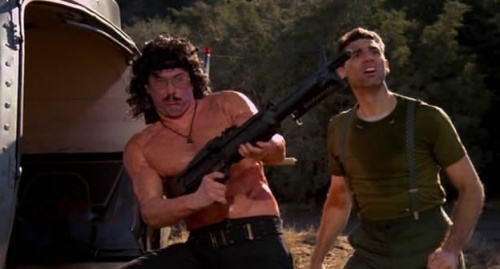 It makes me think of Weird Al's movie "UHF" which has a rip off of the Rambo movies. And, when Al shoots the enemies, there is a running body counter. had not realized the RW and MW scores were down around 20 that does suggest that they have no skills but then skills are not listed because a RW or MW score accounts for them if present. these are canon fodder troops which are no doubt transported in vats aboard sathar ships. That would be my thought as well. Training alien agents has always been carried out far from any Sathar home planets because the Sathar seem to find other beings repellant. Several years ago the Sathar established a training base for espionage agents on a lake close to the Heliope village on Starmist. The Heliopes provided excellent cover for the Sathar operation. The Sathar have built a heavy weapons bunker and set up a watch on the Heliopes. The Sathar also use the base to work on biogenetic constructs such as the Slither. A while ago a merchant ship carrying Maximillian Malligigg discovered the planet. Alarmed, the Sathar decided to use the delay between the time they sent their official report and the resulting investigation to evacuate the base. When the warships arrive and after evacuation is complete; the Sathar plan to destroy all lifeforms on Starmist. The Sathar will let the PCs land since they plan mass destruction anyway, but they will shoot the PCs down if they try to leave. During the day the players will see the hologram. The hologram projects an image of the bluff and rolling hills as well as the pond. At night the holograph is turned off and the PCs will be able to see the buildings by means of night vision or a light. The rocket launcher in this bunker is not the same as that listed in the Expanded Rules. This is a larger, military version capable of shooting down aircraft and/or spacecraft in orbit. Check the optional scenario on page 21 for use of this device by the players. It is the weapon used by the Sathar to shoot down any flying machine that travels above 30 meters. Note: I do like the Starmist module. It provides a creative referee a lot of flexibility, but it is at the expense of fleshing out some particulars, which I will get to. Regarding the Sathar base, the rocket launchers listed are probably assault rockets. These can shootdown jetcopters, though instead of blowing such a craft to smithereens, the PCs at least have a chance to survive a crash. The Sathar weapons bunker is located behind a small bluff at the northeast end of the lake (see Rift landing Map). The three main turrets stickup above the level of the bluff and can fire in any direction using heavy lasers, a sonic devastator, and a recoilless rifle. The recoilless rifle fires only on alternate rounds and rises on hydraulic jacks for firing over the top of the sonic devastator. The next round it will lower into the turret area and reload. The bunker and training base are being evacuated. None of the buildings contain anything of real value, only trash or low value equipment such as lighting units, switches, etc. No doors in the training base are locked unless noted and will slide open at a touch. When a weapon is fired and hits the bunker complex, use the Bunker Hit Location Table on page 23 to determine the location and any special results from that hit. The bunker has numerous albedo screens with independent power supplies usable if the main power is cut off. The power pack for each screen is 100 SEU. Note: the base seems to be well-thought out, even to the point where it has a hit location table. Why would the albedo screens only be powered by a 100 SEU pack? My guess is so it gives the PCs in the the Clikk battle tank a chance. While PCs are in the training base area, they will encounter the Sathar bio-constructs. The S.A.S.E. and S.A.S.I. robots are programmed to self-destruct on the verbal command of any Sathar. The programming cannot be altered or removed without destroying the robot. This room contains a nuclear power unit set to self-destruct. Any characters with technological PSA of level 2 or higher, will know what is happening and will be able to determine that the unit will explode in three hours. They will not know that the self-destruct can be shut off by the base commander (at your discretion). If the commander is killed, the system is programmed to explode in 12 hours from the time of his death. A character with technological PSA of level 4 or higher can prevent the explosion. An explosion will destroy all unprotected lifeforms within the rift. If PCs shut the reactor down then all power to the training base is cut off. The weapons bunker has its own auxiliary generator that also powers the elevator. Note: does the section above indicate there is some possibility of role playing with the Sathar base commander? The worm who is ready to kill itself with a suicide bomb? I guess so. Since the wartank can will also explode with a nuke... which I think would kill all life in the rift... there seems to be a bright future for the player characters. 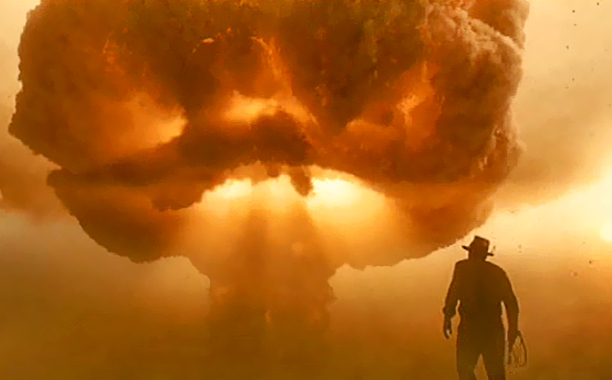 A'ssuu's death triggers a "dead-man switch" that activates the base self-destruct mechanism. Several implanted explosives in his body activate at his death. No revival is possible. A’ssuu is in the operations center and is seated in a control chair. A transmitter is implanted in A'ssuu's body. Upon his death it will trigger a self-destruct system that will destroy the base and melt down the reactor in one hour. Once this signal has been sent, explosives implanted in his body will detonate, causing 3d10 damage to all characters within 2 m.
A'ssuu's ability scores are pretty good. It is either from the Middle Caste or a lower level Upper Caste member. The module refers to A'ssuu as a "he," and though I hate the bastardization of English with "gender neutral pronouns," the Sathar would fit the bill for using something like this. If so, I'd probably pick "zie" = he/she, zir = him/her, zirself = himself/herself... After that, they = they, their = their, etc. Most of the other so-called gender neutral pronouns are absolutely awful and confusing to use. But, I shall stick to calling A'ssuu an "it" or "itself" as best as possible. Back to an analysis: The base commander only has a level 2 in beam weapons? Well, the pre-rolled characters are mostly at level 2, so the enemy's skills are set accordingly. My guess is that the original base commander left a while ago when the Sathar decided to pull out. A'ssuu is a young, Upper Caste member being given his... its... first chance at command. Unfortunately the PCs' arrival cuts this command short. It should also have a Melee 1 skill or how about a Martial Arts 1 skill. That worm could do some Kung Fu Fightin' moves! Think of the possibilities there, especially when his... um, its... command chair is disabled. Why a bone knife? Why is it an assassination weapon? OK. L.M. hypothesized that the worms might be allergic to calcium build up in their bodies -- since they don't have a skeletal structure. Sounds good to me. It would be a slow acting poison on Satharoids, and painful too! Cut ability and skill scores in half while it is in effect! A'ssuu probably should at least have a computer 1 or 2 skill. What else is missing with him... er, it? As the base commander... even the temporary one... how about some personality? OK, he... it... is only there to be killed, but the terrorist NPCs get a better write up about their motivations than the Sathar. It has its hypnotic ability, right? It would be used if given a chance, right? What kind of ammo is A'ssuu carrying? At least one clip in the pistol? But wouldn't it have at least 1 spare? And the albedo screen, is it powered off of a beltpack or a backpack? Since this is a training base for Frontier terrorists, it is probably a UPF beltpack. Let's say manufactured by the PGC!